This includes the largest wildfire in modern history occurring only months after the most destructive wildfire in modern history occurred. The Thomas Fire burned over 280,000 acres in Ventura and Santa Barbara counties, as well as destroying over 1,000 homes and business, and is officially the largest wildfire in California history. The Tubbs Fire killed 22 people in Sonoma and Napa counties as well as destroying almost 6,000 homes in businesses on its way to becoming the most destructive wildfire in California history. It is strongly believed that negligently maintained power lines by SoCal Edison and PG&E were responsible for causing these fires. 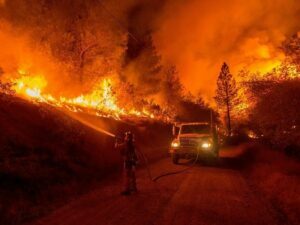 Improperly maintained lines have been identified the cause as many of the most destructive wildfires in California history including the 2007 Witch Creek / Guejito Fires in San Diego that killed 2 and destroyed almost 2,000 homes and the 2015 Butte Fire in Amador County that killed 2 and destroyed almost 500 structures. While CalFire has not announced the results of its investigation into the causes of these fires, initial evidence strongly suggests the power companies may be at fault. In the minutes before the eruption of the Tubbs Fire there were numerous 911 calls reporting downed live power lines in the area where the fire originated. SoCal Edison has publicly acknowledged that it is under investigation as a cause of the Thomas Fire as investigators note the company had equipment at the location where the fire began.